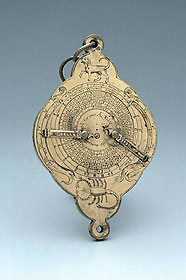 This instrument presents, besides the actual time-telling devices, a table of holy days and numbers used to find the date of Easter. The alidade, finely engraved, has two small folding sights. Figures of a dog and of a scorpion on the disc complement the foliate decoration. Some scholars have cast doubt on the authenticity of this instrument, citing as evidence some constructional details.